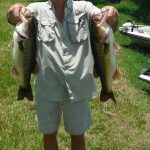 www.okeechobeejust4bass.com fished with the Bass Rattlers today on Lake Okeechobee. I fished with Mr. Dean Morgan of Wellington FL as a co-angler. Rob Morgan finished 1st place with 14.86lbs, Steve Stout finished 2nd with 13.50lbs, Mike Finn finished 3rd place with 11.21lbs and Just4Bass finished 4th with 11.09lbs. Here is a picture of Dean.